The Australian dollar strengthened by as much as 1.1% to .7446 per dollar after the central bank suggested there won’t be a rate cut anytime soon. The Reserve Bank of Australia kept its benchmark interest rate at a record-low of 1.75%. “Taking account of the available information, and having eased monetary policy at its May meeting, the board judged that holding the stance of policy unchanged at this meeting would be consistent with sustainable growth in the economy and inflation returning to target over time,” the RBA said in its statement. 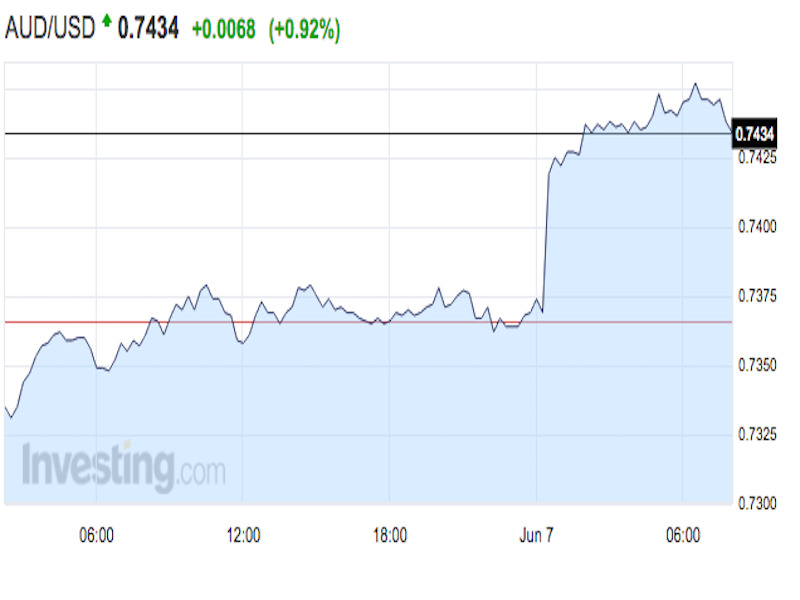 However, the bank also warned that a stronger Aussie dollar could complicate things. The dollar is little changed at 93.96 in the aftermath of Fed Chair Janet Yellen’s speech on Monday. Notably, although she expressed concern about Friday’s jobs report, she once again argued that a rate hike would be appropriate if data continued to firm going forward. Separately, it looks like Hillary Clinton clinched the Democratic Party’s presidential nomination. The British pound is up by 0.9% at 1.4574 against the dollar after suddenly spiking by 1.5% overnight. “The volatility has not gone unnoticed by currency trading banks Saxo Bank A/S and FXCM Inc., which have raised their margin requirements for pound trades,” noted Bloomberg’s Lorcan Roche Kelly. The Indian rupee ended stronger by 0.3% at 66.7500 per dollar after the Reserve Bank of India kept its key rate at 6.50%, as expected. “The inflation surprise in the April reading makes the future trajectory of inflation somewhat more uncertain,” noted RBI Governor Raghuram Rajan. The euro is little changed at 1.1347 against the dollar after eurozone GDP was revised up. Data from Eurostat showed that the eurozone economy grew by 0.6% in the first quarter, a bit faster than the previous look of 0.5%. The Japanese yen is weaker by 0.2% at 107.74 per dollar. The currency is the only major that’s not gaining against the dollar today.